"Delicious creamy centers will get everyone raving." Microwave 1 cup chocolate chips in a microwave-safe bowl on low in 30-second intervals, stirring after each melting, until chocolate is smooth and warm, 1 to 3 minutes. Do not overheat or chocolate will scorch. Beat cream cheese into melted chocolate until smooth; stir in wafer crumbs and raspberry jam. Cover and refrigerate until mixture is semi-firm, about 4 hours. Roll chocolate-cream cheese mixture into 1-inch balls and place on a baking sheet or platter. Freeze until firm, about 1 hour. Melt remaining 1 cup chocolate chips in the microwave, 1 to 3 minutes, stirring every 30 seconds. 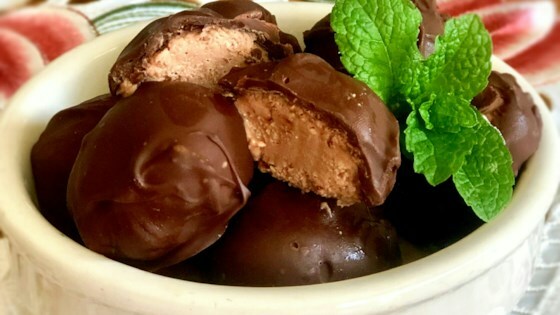 Dip frozen chocolate balls into melted chocolate; allow chocolate to set before serving. These raspberry chocolate croissants are elegant and delicious! It was too mushy for me. These turned out great! My husband said they tasted as good if not better then expensive mall chocolates. Thank you for the recipe! I used 1 cup of vanilla wafer. As good as any expensive chocolate. Love these, even though they are super rich.